Ugly Appliance – Shut the Door on It! I didn’t want a built in microwave because I wanted the kitchen to feel old school. Staring at me, judging me, taunting me – til I could take it no more. Seriously, how could I let that thing take up valuable display space? I’ve finally sniffed the smelling salts and come to my senses! What do I have this amazing appliance garage for if not for the biggest appliance on my counter? I made sure the inside of the cabinet was finished and two electrical outlets were put in before the cabinets were installed. I chose this door style that swings forward and lifts up, then pushes in along the top for a nice, clean look. And now I can display all things cute! 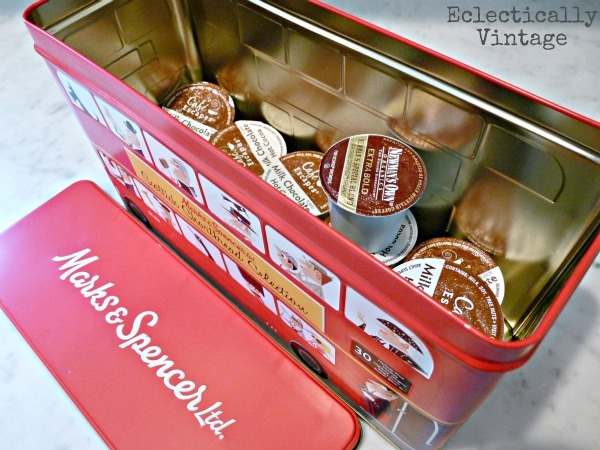 Like this thrift shop Marks & Spencer biscuit tin – which holds my girls Keurig hot chocolate cups. Better late than never! This display will probably change as often as I color my hair (not that I need to …)! See my full kitchen tour here. What am I trying to hide? The thirty extra pounds I’ve gained since menopause. Unfortunately, I am unsuccessful. Let’s get our muffin tops together for a cup of coffee! KELLY!!! First you have a vestibule I need and now I NEED an appliance garage. Keep in mind, my washing machine is outside, so that is a literal request on my part. But I would also need an electric appliance garage door opener…and while I’m at it why don’t I just buy someone to do the laundry! Love the tin hiding the k cups, too. ah…I should have known. I’ve been keeping my eye out for a super cute cow creamer that’s out of the ordinary. No luck yet! … and now I have even one more reason to covet your amazing kitchen! OH MY my jersey friend — come on over and i have TONS to hide! i can keep you busy for the next 100 years! lol!!!! I LOVE YOUR STYLE!!!! you really rock at this and your kitchen…well it is simply AMAZING but you know that ; ) hugs!!!! I soooo want to hide my microwave. First I need to bring it into this millenium…!!!!! It is old, and it is big. I know just how and where I want it to go and I know what I’ll use the existing space for too. waiting for the extra cash to roll in —and I’ll purchase another one! Love, love, love that tool box…on that shelf. I almost purchased a ‘kennedy” tool box for my kitchen… now, I’m wondering why I didn’t? I went with a cheapo microwave. Don’t you just hate when you leave something behind and then regret it right away!! I bought an old toolbox recently for $3 at the thrift shop. It’s metal and I think I’ll plant some flowers in it. Well what can I say, this blog keeps getting better and better.So happy I found it! I still don’t no how I did it, but what a blessing! Fantastic idea and I am loving the Little Chocolate cups container and the blue box behind it (forgive me ignorance I don’t know what it is but looks fabulous!)! Everything looks lovely! 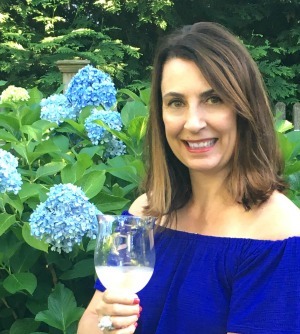 You made my day – thanks so much for liking my blog! Glad you found me too! I don’t know what that old blue box is called either!! What am I trying to hide? Apparently everything I stuff in my appliance garage. Can’t use it as a garage since it functions more like a storage bin these days. Yep, I’d chalk this one up under “big improvement”. Yay for displaying our pretty things! We’re hiding our microwave in the island. That’s using your noggin! My microwave is hidden in the pantry. I’m hiding the toaster in a roll out cupboard and my olive oil in an antique stoneware jug but I still have tons of things I’d like to hide. What am I hiding? Piles of teenage crap — cleats, backpacks, sweatshirts, soccer slides, flash drives, misc school papers, ipods, blah, blah, blah. I need something bigger than an appliance garage. 🙂 Another wing on the house might work. LOL. I love that! We’ll be moving our microwave into our walk-in pantry (someday when we make that space). This is so clever! I love your entire kitchen. Dreamy! I agree – hide it if you can! Although, with my family and our schedules, that door would be up most of the day anyway and the whole “hide it” intention would be moot. One can dream that one day, one can be like Kelly and keep her microwave out of sight – in the same dream that one can have a kitchen like Kelly. 🙂 Have a super Tuesday! Love, love, love this! A garage like that in the corner is perfect for hiding things and not wasting space. Well done! Love it! 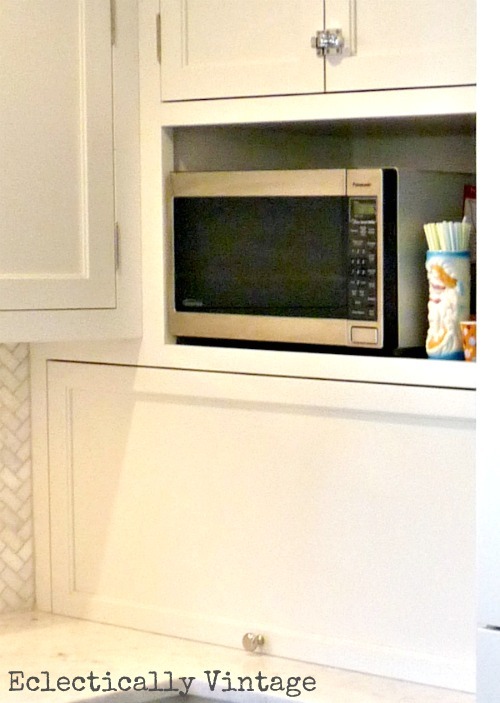 We hid our microwave in a cabinet too, since not a single one is pretty and they need upgrading every dew years so built-in is just begging for trouble! I have that same bramble of cords under my girls desks! Need to get them under control! if it’s possible get a curtain rod and hang fabric on it between the wires and the view of the wires. That’s what I did with the tv wires in my living room. looks like a hole instead spaghetti of wires. Your kitchen looks as it should now, with that box out of the way. That’s where all microwaves belong, behind a door. Your kitchen is really beautiful! Oh how I would love to have me an appliance garage. I love how you can hide and store things in it. Your kitchen is gorgeous Kelly! I’m kicking myself for not putting in an appliance garage right now! 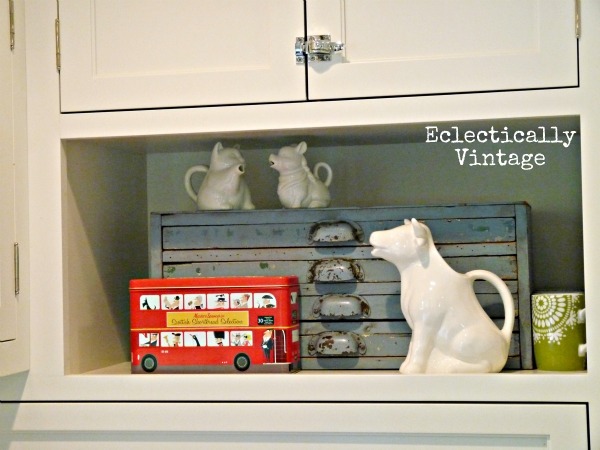 I too was trying to go vintage but would actually love to have a place to hide the microwave, toaster, coffee maker. I guess I could go really retro and try to live without these appliances! Just popped over to your blog and tried to comment but couldn’t! 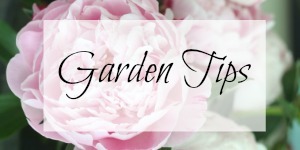 I love your house, style, garden, neighborhood! That desk you recently redid is amazing and the old vintage typewriter too (I just found one at a yard sale for peanuts)! Love it – a child garage complete with it’s own mini fridge so they can stay there for hours on end while we read magazines and get pedicures! You are so sneaky, You’d never know it was there….it will taunt you no more! Thanks so much for your visit today. 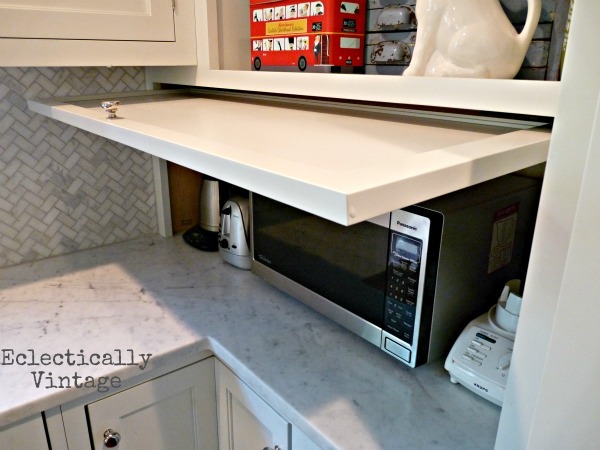 i love this hidden storage idea! would love to try this one soon. So much better to hide it – looks fantastic! I am so jealous of your cabinet door! Such a fantastic design choice and I love the decor on the shelf above! Thanks for sharing this with us this week! You always bring something beautiful to the party! I love your kitchen ooh so much, what a brilliant move to conceal the microwave. we are in the midst of finishing our new kitchen and I too had to deal with the microwave location , I went with in the island , I built onto a smaller island to create an open shelf for it , but you can not see it from most views into the kitchen . I think its going to be hiding very well, not too sure how we will like having a lower microwave but there was no other option , not on my counter , no way, well not after we get it all finished anyway. You made a good decision. The microwave is out of sight and your new vignette looks darling. Those toys are too cute! I like some of my appliances… I have a red toaster! Ohhh, your red toaster and my oven should get together! Oh I have papers everywhere – just moved them to take this pic!! wow! what a great idea! And that shelf is perfect for that amazing little drawer piece! wow…now off I go to see the whole tour! Thanks Colleen (my sister’s name too) – if there’s a way to display, I’m all for it! Oh, you don’t want to know what I’m hiding!! Dirty laundry is just the tip of the iceberg! Looks great, Kelly! I’m mostly trying to hide legos and dirty socks, and my kids have found that under the beds is the best place for these things. 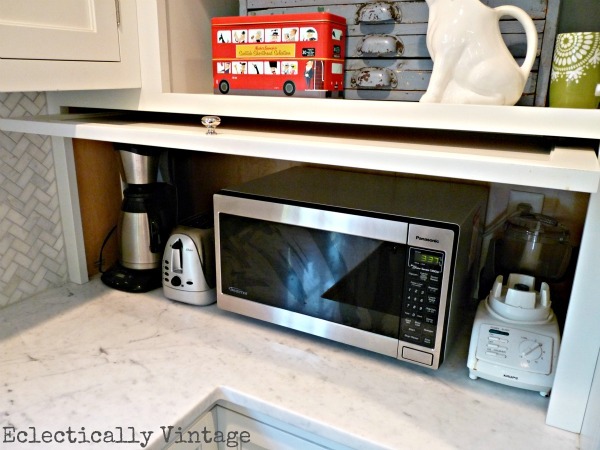 Love that you added cute decor to the empty microwave space. I probably would have stuffed it full of ugly cookbooks. You are an inspiration – thanks for linking up! That is awesome! I have the perfect spot that I would love to do this. I might have to talk my husband into tackling this project! Love it! What an awesome idea! Glad you like – hiding clutter is my specialty! Where did you get your hinge for your slide up door? Hi Susan – my cabinet maker put that in so I don’t have a source. Hi Kelly, I liked your appliance garage. 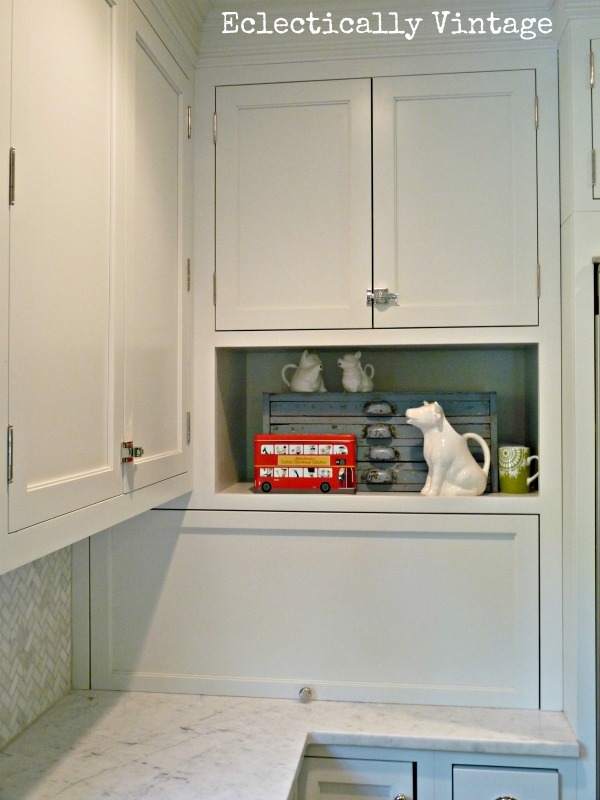 I am hoping you could let us know where you got it or the name of the cabinet company that makes the lift up door. Thanks. 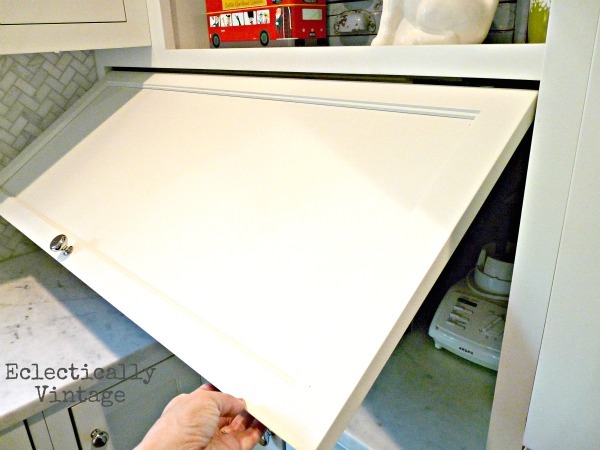 Hi Val – my cabinets were custom made but I found this article that you might find helpful: http://ext.homedepot.com/community/blog/places-kitchens-with-an-appliance-garage/ – let me know if you need anything else and good luck!